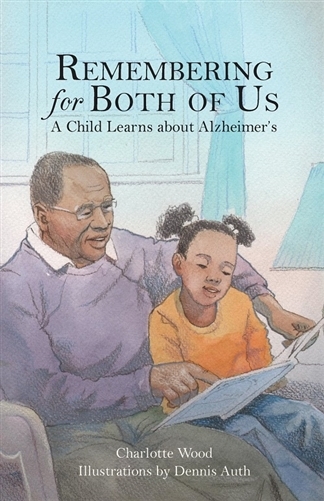 Remembering for Both of Us is a touching story of a child’s first glimpse of Alzheimer’s and a reminder that ties of the heart transcend age and illness. Tasha loves her grandfather, and she knows that PaPa loves her. But lately, PaPa has begun to forget things. He’s often confused and upset. Sometimes, he doesn’t even recognize his own family. How can Tasha’s grandmother help her see that while PaPa is changing, his love for Tasha has not? Charlotte B. Wood retired after thirty-two years of teaching in the Chesterfield, Virginia, public schools. 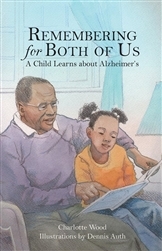 The birth of her first grandchild provided Charlotte with the inspiration to pursue her hobby of writing for children. Sadly, her husband, William, also a teacher, was diagnosed with Alzheimer’s shortly after his retirement; he passed in 2013. Charlotte’s desire to share insights learned from the challenges of her husband’s illness resulted in Remembering for Both of Us. She lives in Midlothian, Virginia, and is active in her community and church. Dennis Auth hails from Pittsburgh, Pennsylvania, where teaching guitar and leading a rock band landed him in art school, inspiring instructors and fellow design students alike. He began freelancing after relocating as an ad-agency art director to Virginia Beach, where he illustrated in multiple media for projects ranging from children’s books to striking architecture. The Tidewater area is home to Dennis, his wife, and their grown children. This was a great way to introduce my grand kids as to what I know is happening to me.